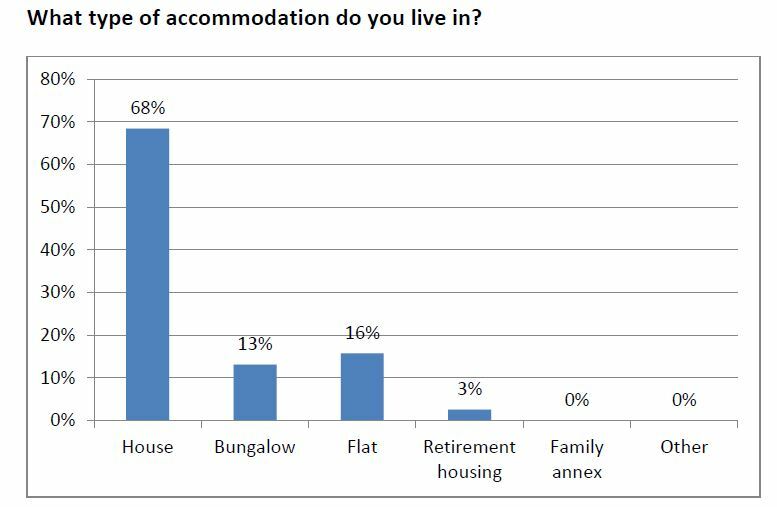 68% of the group live in a house, which probably was their family home. Given that now most are married or single and are over the age of 60, it suggests the majority are likely to be under occupying their house. This is a significant issue in terms of the direction of current Government policy. For renters it could mean that they would be hit by the “bedroom tax”, if it were extended to older people. For home owners, they probably have a financial nest egg which they could cash in, to pay for a better lifestyle in their old age, provided they were prepared to downsize to smaller accommodation. This entry was posted in GRUMBLESMILES TRUST and tagged CAFE PROJECT. Bookmark the permalink. Absorbing facts, asset rich, maybe? and money poor, maybe? I think as one ages one has to have a mind set ready to accept change. In my younger days a semi or detached house or even a bungalow was the ideal dream in which to bring up a family, and British Society to some extent encouraged this and tended to ‘scoff’ at the european ideal of flat dwelling in complexes was frown upon, and the english always regarded rented flat dwelling was a social (council requirement) or for the very rich in London, and was looked down on. Landlords like Rackman made a bad name and reputation in the housing industry. Even warden controlled housing for the elderly was by semi’s detached bungalows, so there was an unwritted notion against community living in coplexes that contained flats and at a number of levels above ground within the same building, unless one was a socicial-council tenant!. Now as one enters ones twilight years, or golden years, if the accommodation is correctly designed, and priced from a space and economic point of view: Then downsizing is a very worthwhileoption, and indeed personally to me a very sensible one. Releasing ones existing asset value, if one looks carfeully at the market place, may allow one to purchase/rent/share a property of modest comfort and also give one peace of mind and the ability to consider for ones self and spouse/partner in some form of level of care other than that provided by the state (NHS)..
One does not have to be frugal, but careful on how one enjoys ones life and how one spends one’s lifesavings, with modest travel and expenditure. One has to keep one eye on the state(Government)? They will provide minimum cover, but at their expense and at their direction, and if one doen not keep a modicum of financial independance, one becomes a social encomberance on the state, with no flexibility to do as one may possiblly wish. The choice is for us each to make freely, and to enjoy our passing years with enjoyment.